Developed by vets, Pure Animal Wellbeing's tasty kangaroo based chews that contains Tryptophan, B group vitamins and a blend of multivitamins and nutrients to support the general health and nervous function in dogs. For long term anxiety issues, Tryptophan and B group vitamins to help maintain emotional balance in dogs. General anxiety driving changes in serotonin levels (eg. separation anxiety, travel anxiety). 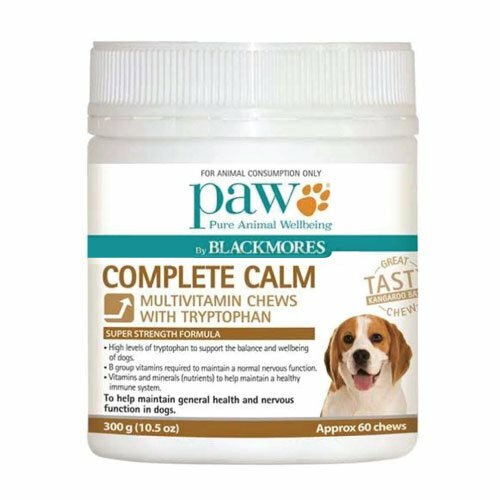 PAW Complete Calm Chews are available in a 300 g tub. Each tub contains approximately 60 chews. Taken daily, they help to maintain general dog health and nervous system function for a positive, healthy and happy dog. Complete Ingredients: Kangaroo meat & meal, rye flour, flaxseed, binders and stabilisers, soy flour, water, tryptophan, processing aids, sodium chloride (salt), vitamin C, methylsulfonyl methane (MSM), colour & flavour, omega-3 fatty acids, zinc sulphate (zinc), pantothenic acid (B5), iron sulphate (iron), vitamin E, niacin (B3), riboflavin (B2), thiamine (B1), manganese oxide, pyridoxine (B6),vitamin K3, vitamin A, calcium iodate (iodine), selenium, folic acid, cyancobalamin (B12), biotin, copper sulphate (copper). Read 1 customer review of PAW Complete Calm. The average customer rating is 5. Yumo, well that is how my spoodle reacts each morning when her 'treat' appears. My spoodle is a little bit of a diva when it comes to food..............will simply not eat or clenches her mouth together and looks away as if to say 'if you think I am going to eat THAT.....'Not so with PAW Multi-Tryplophan chews. Molly (my fur diva) is just over 5kgs and therefore has one chew a day - her mouth is too small to handle the size of the chew, so I cut the chew into 4 pieces whilst Molly waits patiently, then a beautiful sit a chew and a gorgeous smile as she awaits her next piece. Molly can be a little anxious from time to time and already I am noticing a calmer dog.